What's a normal LDL-C level? The LDL calculator estimates the amount of Low-Density Lipoproteins - complex particles that carry lipids in the blood. Their concentration is a very important parameter predicting the arteriosclerotic risk, but its direct measurement is not a part of the diagnostic routine. Instead, the patient's LDL is calculated and presented as LDL-C. It is universally accepted to use Friedewald equation to do so. Read on if you're curious how to calculate LDL cholesterol. 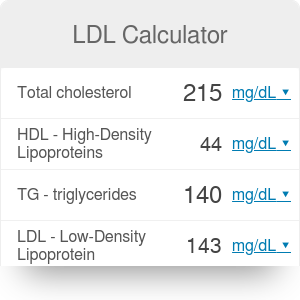 After estimating your LDL blood level, check out our cholesterol ratio calculator to interpret the results. TC - total cholesterol - it's the sum of the concentration of all cholesterol particles, both the perceived "good" and "bad" ones. It should never exceed 200 mg/dL. HDL - High-Density Lipoprotein - a.k.a. "the healthy cholesterol," is associated with lowering the build-up of plaque in the arteries in the process of atherosclerosis, which means it prevents cardiovascular disease and stroke. Its protective function is best when it's over 60 mg/dL. TG - triglycerides - they transport glucose and lipids in both ways between liver and fatty tissue. Their high levels are related to a high risk of atherosclerosis. Their level in a healthy person should be below 150 mg/dL. The formula is using a coordinate of 0.2 for values in milligrams per deciliter (mg/dL). If your results are in millimoles per liter (mmol/L), use a coordinate of 0.45 or use our cholesterol unit converter. In the calculator, you can switch the units by clicking on their symbols. After having the lipid profile measured, you can start the calculation. Check what units are your lab test results expressed in - it's important for the calculation. Insert the total cholesterol level. Enter the High-Density Lipoprotein level. Fill in the third field with your triglyceride level. The calculated LDL cholesterol is presented in the last line. below 70 mg/dL in patients with high coronary risk (SCORE >10%). LDL Calculator can be embedded on your website to enrich the content you wrote and make it easier for your visitors to understand your message.